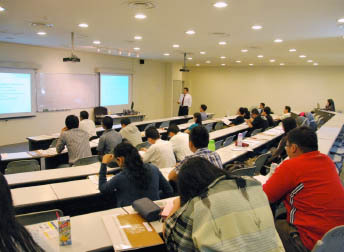 The Young Engineers Section (YES) of the Institution of Engineers (IEM), Malaysia organized the two (2) days: “Basic Project Management for Young Engineers” course from 13 to 14 April 2012 at Curtin University Sarawak Malaysia, Miri, Sarawak. Around 30 participants attended this course. The course was delivered by Ir. Noor Iziddin Abdullah Bin Haji Ghazali, M.Eng. (UM), B.Eng. (Uniten), Diploma Islamic Studies (UIA), P.Eng, MIEM, PMP®, now attached to the Project Management Consultant team in KLCC group for Putrajaya commercial building projects. The speaker is also currently on the Industry Advisory Panel (IAP) for the undergraduate program in project management at University Malaysia Pahang (UMP). The first day covered topics on: Introduction to Project Management, Definition of Project Management, Context of Project Management, History of Project Management and Knowledge Areas & Process Group. Second day covered Project Life Cycle, Project Management Framework, Goal & Objectives, PRINCE 2, Practical approach to infrastructure project management and Project Management Consultant (PMC) concept. According to Ir. Noor Iziddin, project management (PM) knowledge and its methodologies have evolved and improved significantly over the last three decades. This is due to many of the lessons learned from the successes and failures of projects undertaken by organizations. Ir. Noor Iziddin discussed the essence of project management, especially for those who intend to gain a fundamental but solid grounding on project management. The participants also learned the structured and integrated approach including processes, tools and techniques that are applicable to managing the phases in project life cycle. This course contents were closely based on the PMBOK Guide, 4th edition of the Project Management Institute with a short presentation on PRINCE2 from UK. • Understand the structured and integrated approach in initiating, planning, executing, monitoring & controlling and closing out projects. • Understand the role and selection of project manager as well as project organization structure & issues. During the Q&A session throughout the two (2) days course, the speaker answered all questions raised by the participants and shared his route to PMP® certification process which he has gone through in 2008. The course was completed at 5.00pm on 14 April 2012 and Ir. Noor Iziddin received a certificate of appreciation and a memento from Engr. Vivek (YES Session Chairman) to YES Miri Vice-Chairman, Engr. Tiang Kwong Hwo. Readers who have any queries or wish to obtain the course material in softcopy can request directly to the speaker via email at laplace82@gmail.com.